We are minors who fled from West-African countries. We are survivors of the crossing of the Mediterranean Sea. 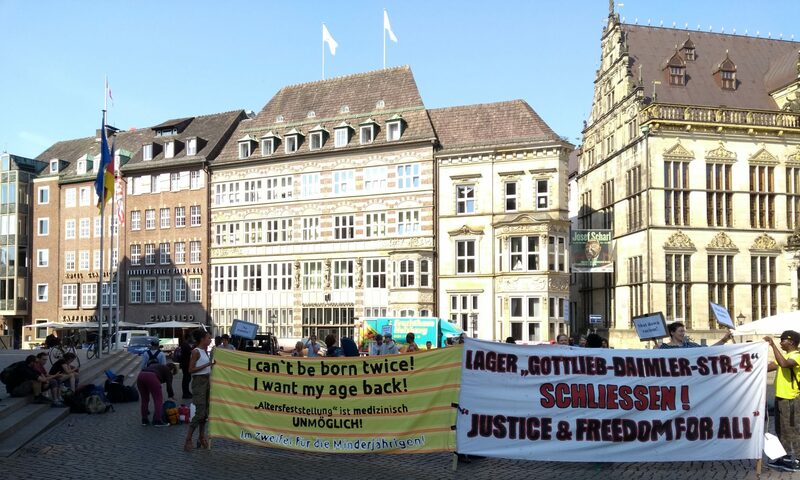 We are the minors who shut down the Camp called „Gottlieb-Daimler-Straße“ in September 2018. The conditions there were unbearable: it was located in an industrial area, it was freezing cold in the winter and way too hot in summer. Four people in one room. We had to stay there because we did not accept the age the authorities gave us. To isolate us and to punish us for insisting on our age. In March 2018 we decided to no longer accept this situation and raise our voices. Since then we organized ourselves together with solidarian people from Bremen. Our protest finally shut this Camp down. 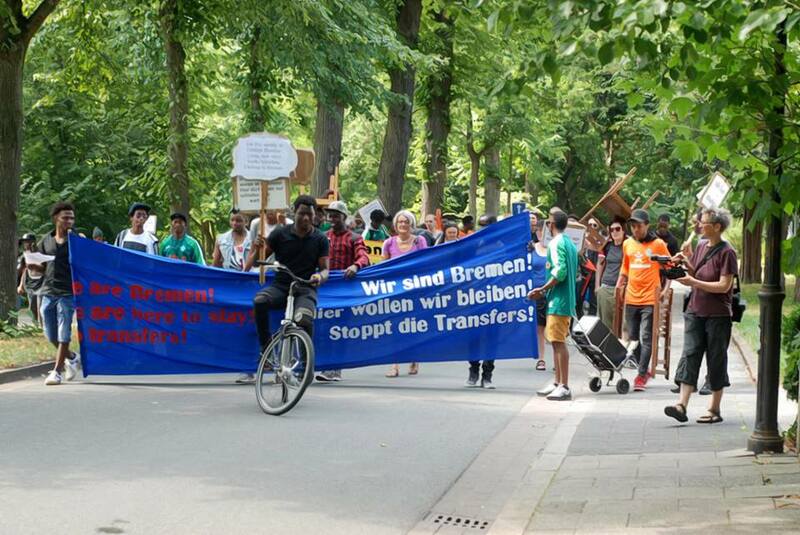 We organized demonstrations and informed many people in Bremen about this situation. But with the camp shut down our fight is not over. Most of us did not get legal papers and we are transferred away from Bremen to other places in Germany – where we know nobody and face deportation to Italy. For us one thing is clear: We are here to stay. We need a safe place and access to build our own future. Bremen is the city that has been the home of us for months or even over a year now. We have made friends here, some of us are even going to school here and we have finally arrived at a place where we could feel safe after a long, dangerous and traumatizing journey. 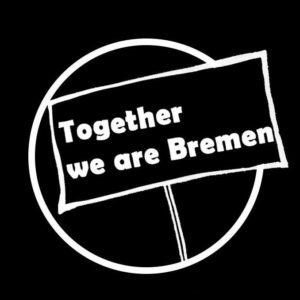 We call our movement „Together we are Bremen“ because we are part of Bremen and people of Bremen have shown us, that we are welcome here! Those who are no longer in the state’s system (which means: no access to healthcare, school, accommodation, food) are now staying with solidarian people to avoid homelessness and we are collecting donations to pay for basic needs like food, transport and medicine. We have experienced how strong we can be, when we stand united. 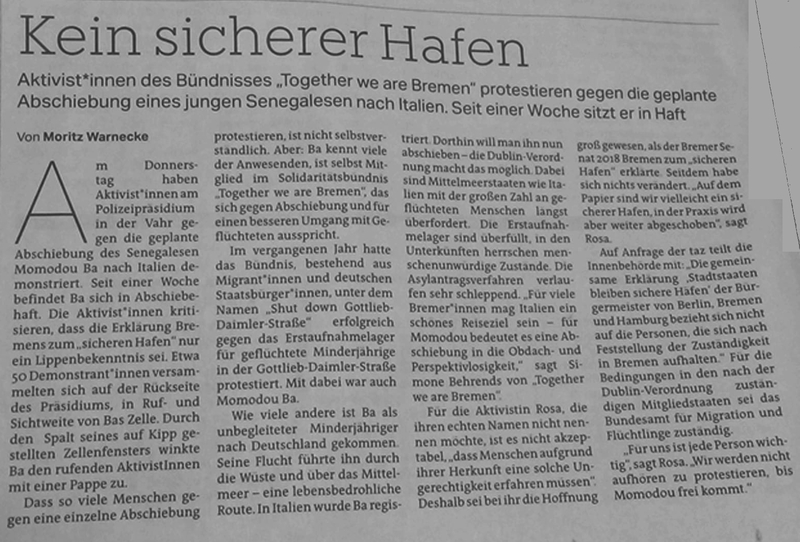 To stand in solidarity with each other and with so many people from Bremen gives us the energy to continue this fight. We have seen, what can be changed if we don’t give up but bring our protest to the streets! Für alle, die ohne Spendenquittung spenden wollen/können, haben wir ein Privatkonto eingerichtet. Schickt uns eine Mail an unsere Kontaktemail und wir senden euch die Kontodaten zu. 14.03.19: Freiheit für Momodou(deu)! Freedom for Momodou(eng)! Liberté pour Momodou(frz)! Ein humanitäres Bleiberecht für die „Gottlieb-Daimler-People“ und Zugang zur Schule! Für ein humanitäres Bleiberecht für die „Gottlieb-Daimler-People“! Wir fordern, dass sie zur Schule gehen und eine sichere Perspektive für sich in Bremen entwickeln können. Ihre Email dient ausschließlich der Bestätigung Ihrer Unterschrift und wird nicht mit Dritten geteilt. Your Email is only needed for confirmation of your signature and will not be shared.